US equity indexes closed moderately mixed, sp -5pts at 2432. The two leaders - Trans/R2K, settled +0.2% and -0.5% respectively. VIX settled +2.4% at 10.90. 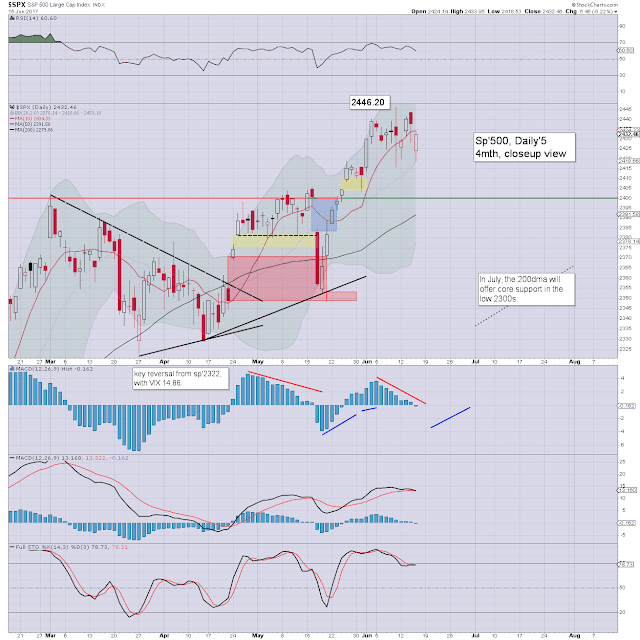 Near term outlook offers further weakness to at least 2410. 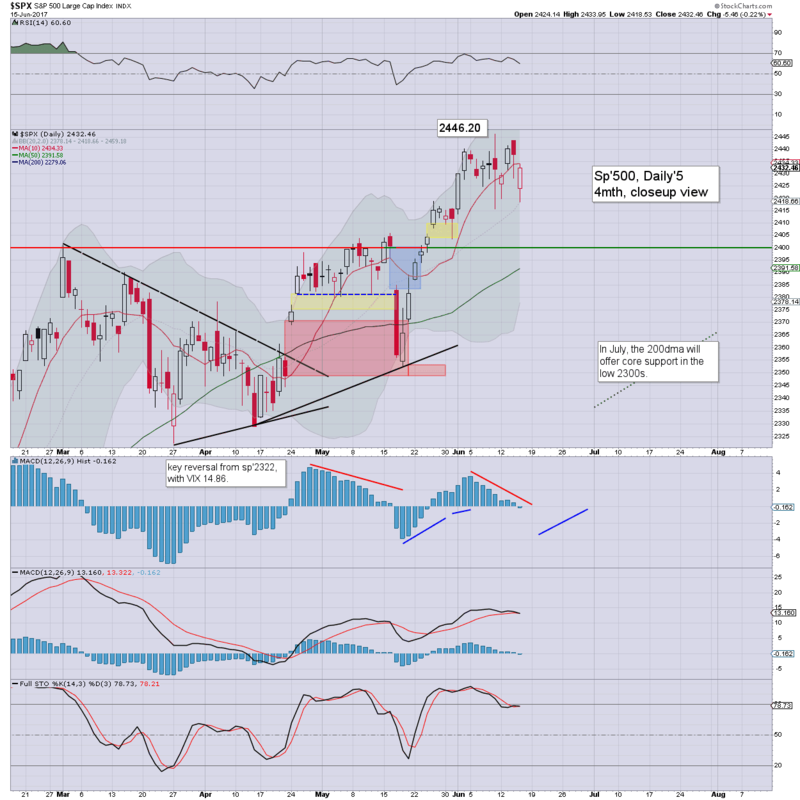 The 2390s - where the 50dma is lurking, would be 'best bear case', before another big push upward into Q2 earnings. US equities opened broadly lower - lead by the Nasdaq, with a morning low of sp'2418. There was then a rather typical latter day recovery. Still, it was a second consecutive net daily decline for most indexes, and on balance, the market looks set for further weakness. 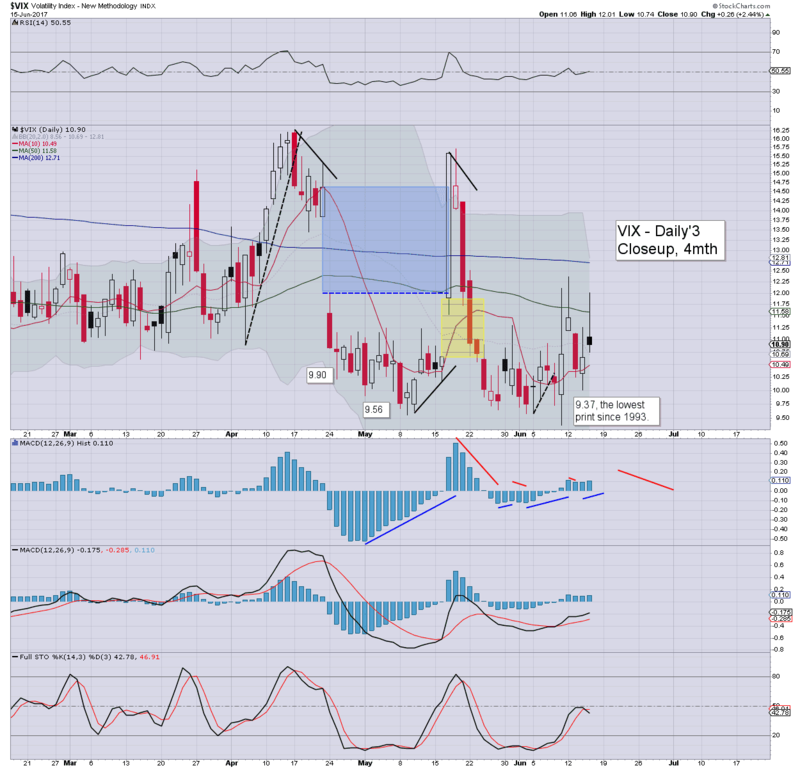 The VIX spiked to 12.01 in the morning, and then cooled into the afternoon. The 13/14s seem due with any price action to sp'2410/00, and certainly with the 2390s. Friday is quad-opex, and such days are inherently choppy. If the market trades lower to 2410/2390, there will be extremely high probability of a key floor being put in, with yet another latter day recovery. Bears... beware. Some of the populace are starting to get real pissed, as the Grenfell Tower fire story continues to develop. There are a great many issues involved, not least the lack of sprinkler systems, and why many thought it was fine to wrap entire buildings in flammable plastic blocks. The current death toll stands at 17, but there is background chatter that it might eventually be in the 75-125 range. There is zero mainstream talk (that I'm aware of) about the burnt out husk of a tower being torn down, but I can't imagine it won't be. I've no issue with most of the designs, just don't wrap them in flammable plastic blocks!